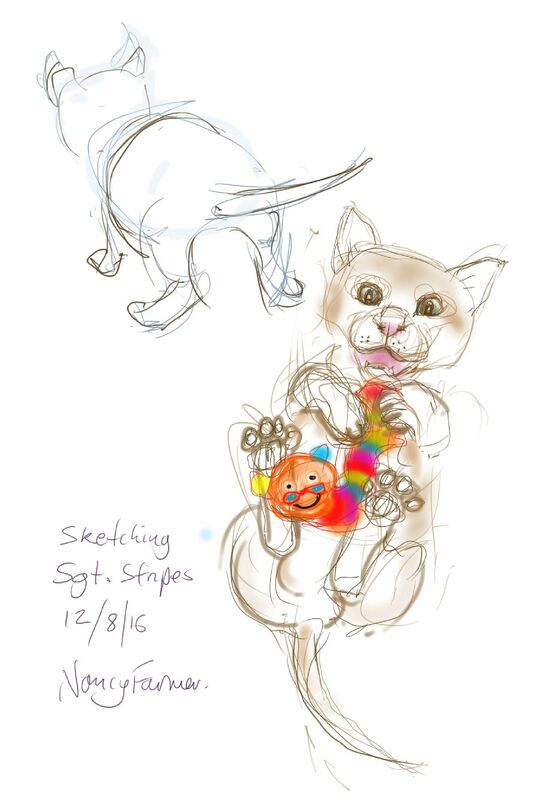 This entry was posted in Cats and tagged art, cat, cat drawing, cat-of-the-day, kitten drawing, kitten sketch, Sergeant Stripes on August 12, 2016 by Nancy Farmer. Arthur is so tiny and fragile, he feels the best place for him would be in an egg box. It is fortunate therefore, that he fits it so well. 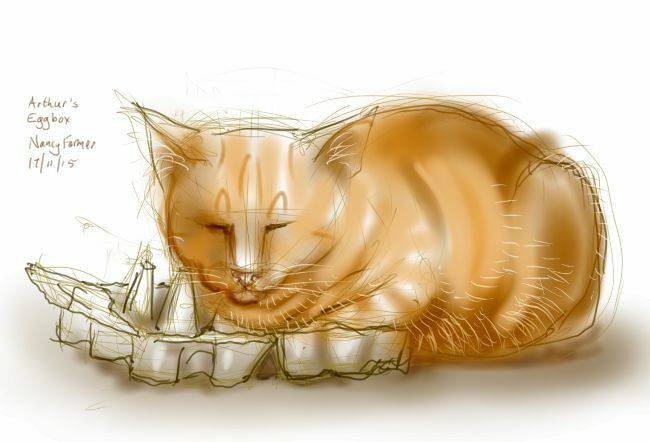 This entry was posted in Cats and tagged arthur cat, cat, cat in a box, cat in an egg box, cat-of-the-day, drawing, ginger cats, sketch on November 17, 2015 by Nancy Farmer. Outside is a beautiful day, but Percy is lurking in my studio in the hope that the bowl of kitten food that I have hidden will magically re-appear. Freyja is lurking in my studio in the hope that Percy will do something interesting. it is a sort of three-way stand-off. We shall see who breaks first. 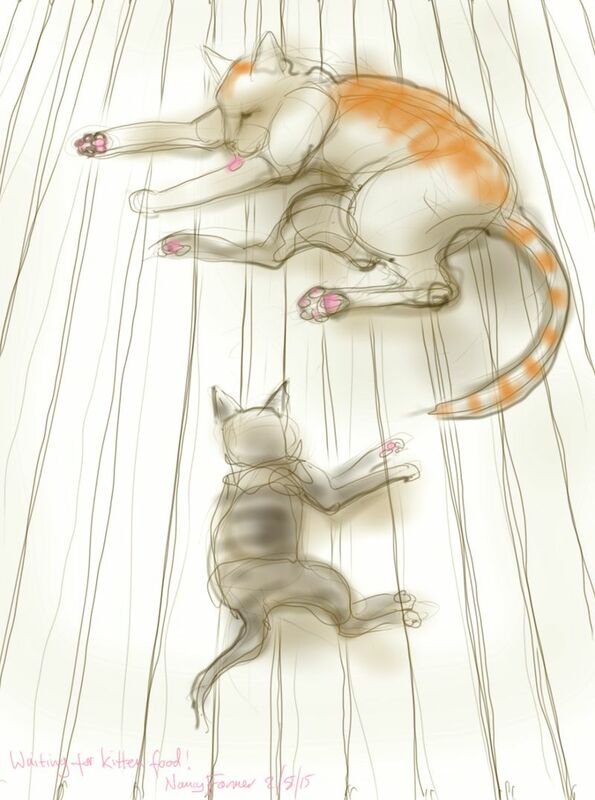 This entry was posted in Cats and tagged art, cat, digital, drawing, Freyja Kitten, illustration, kitten, Percy Cat, sketch on August 2, 2015 by Nancy Farmer. It’s six o’clock on a fair August evening, and the kid had been shut inside again. Arthur and Percy can hang out and ablute in peace, without fear of being pounced upon by small and enthusiastic kittens. 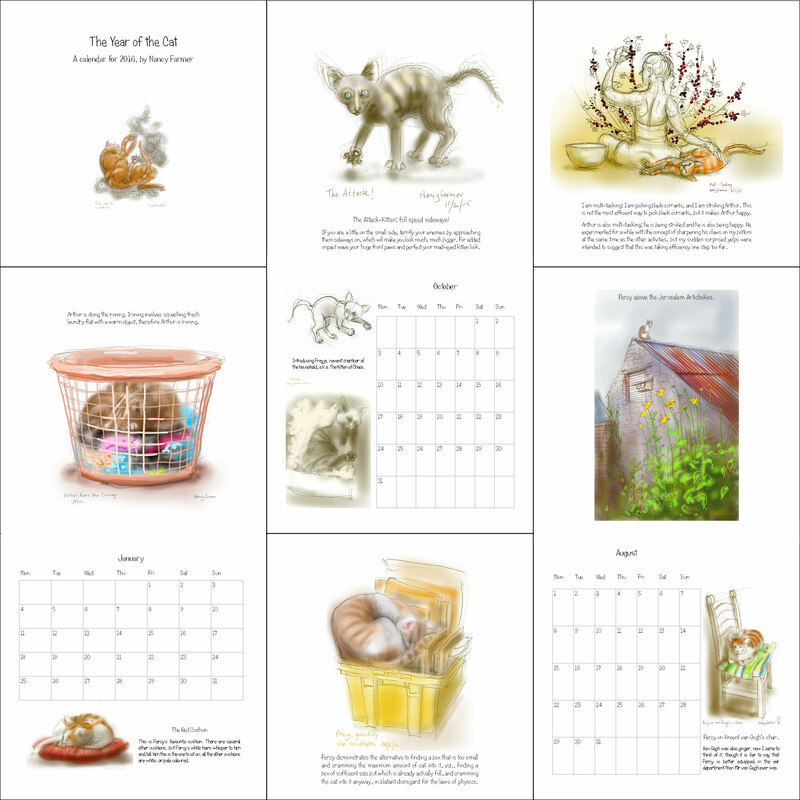 This entry was posted in Cats and tagged art, arthur cat, cat, cat washing, drawing, ginger cat, illustration, sketch on August 1, 2015 by Nancy Farmer. All the fun things in the Garden! Freyja has had her jabs, her microchip and is allowed out (supervised as present, as she is still a mad little kitten). She has discovered that the garden is just absolutely full of fun things; Arthur is at pains to point out that he is not one of them. 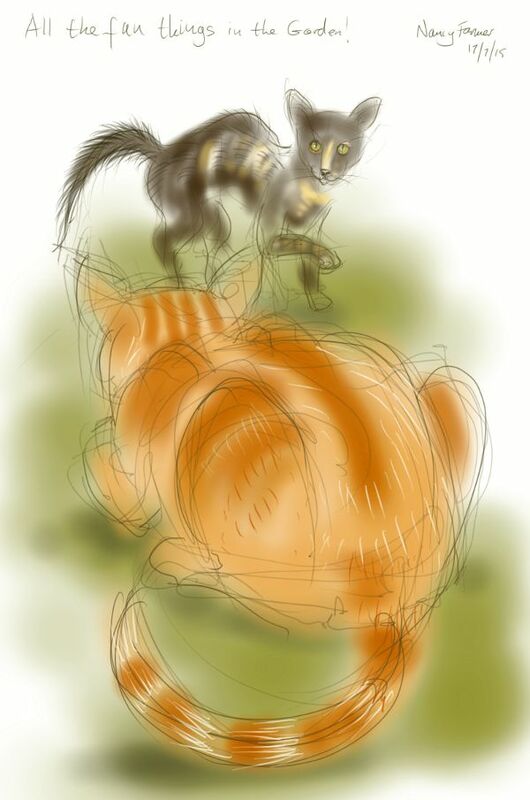 This entry was posted in Cats and tagged art, arthur cat, cat, cat drawing, drawing, Freyja Kitten, ginger cat, illustration, sketch, tortoiseshell cat on July 17, 2015 by Nancy Farmer. If you are a little on the small side, terrify your enemies by approaching them sideways on, which will make you look much, much bigger. For added impact wave your huge front paws and perfect your mad-eyed kitten look. 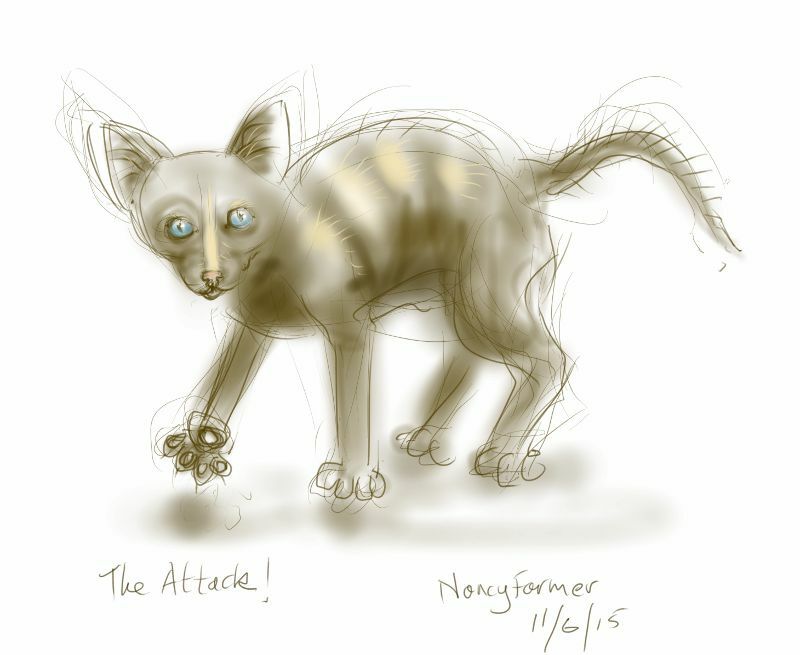 This entry was posted in Cats and tagged art, Attack-Kitten, cartoon, cat, cat drawing, cat-of-the-day, digital sketch, Freyja Kitten, illustration, kitten attacking on June 11, 2015 by Nancy Farmer. Do not think that this greenhouse vigil is because it is warm and sunny in here, nor even because of the nice blanket one finds discarded by a careless owner. It is because of the frail and vulnerable Aubergine seedlings that one has discovered yet again stand out here without protection. Two nights ago one’s human forgot them entirely and left them out all night and they almost died, so one has to ask, if one’s human forgets the Aubergines, what else might be forgotten? 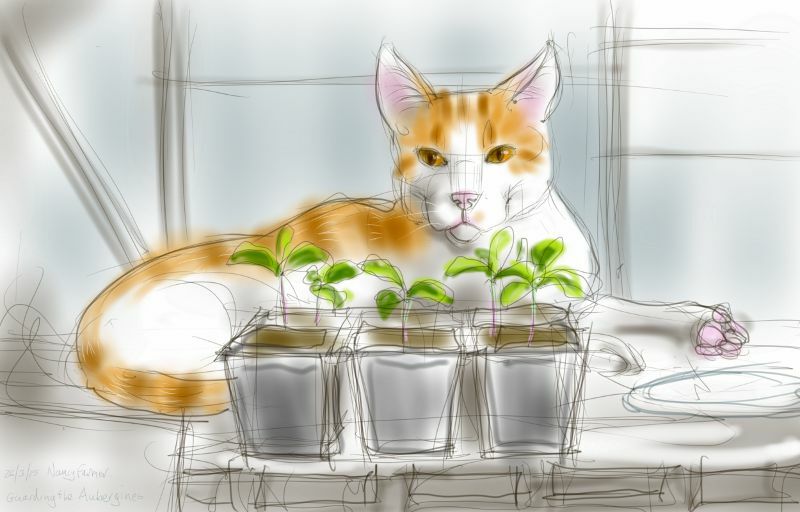 This entry was posted in Cats, Plants and tagged art, Blencathra, cat, cat drawing, cat-of-the-day, ginger and white, greenhouse, my garden, Percy Cat, seedlings on March 26, 2015 by Nancy Farmer.